2016 has been a major year for the climate: the Paris summit (COP21) (December 2015) saw political institutions slam the issue of climate change on the table, with unprecedented international consensus. This marks the start of a critical era for planet Earth: that of the fight against climate change and its devastating environmental impacts. But temperature records keep tumbling, with NASA warning that 2016 is set to be the warmest year in history. Similar conclusions were drawn by the United Nations Environment Programme UNEP in its GEO-6 report released this summer, backing the decision taken at the COP21: action to counteract climate change needs to be taken as soon as possible. Food is inevitably among the major contributing factors and is a key area that needs reform if we are to build a sustainable existence on Earth. Which is why the UN opted to establish the climate as a central issue for 2016 World Food Day. Agriculture and livestock are critical for generating sufficient food to sustain the population, so it is not hard to imagine the impact these have on the environment. We also need to understand exactly why the world must think again about what it eats, not only to eradicate hunger, malnutrition, death by starvation and the growing incidence of cardiovascular disease, but because we are literally eating up the planet. The amount of food per capita wasted every year by consumers stands between 95 and 115 kg in Europe and North America. The figure is far lower in other regions of the planet (between 6 and 11 kg annually in sub-Saharan Africa and South and Southeast Asia) according to the FAO. One third of all food produced is never eaten by humans. This far more illustrative numeric view of the problem comes from the Save Food program, an initiative aimed at eradicating food waste worldwide, bringing together governments, industry, civil society and all other players involved in the process. Our current food trends are unsustainable. Change is required at a number of levels, driving a transformation of the values and parameters surrounding food consumption itself. Ecological rationale must be included within the logic that shapes food demand. Social awareness raising is unquestionably a key step in the process. Furthermore, the one third of food that goes to waste generates financial losses of some 940 billion dollars, as well as 8% of annual greenhouse gas emissions, according to the same program. While this is our current position, forecasts point to a far darker future: the population is set to rise to 9.6 billion people by 2050. Agricultural production must inevitably increase, if the planet is to feed a population of that size, by up to 60% (by 2050) according to estimates from the FAO. How can we develop more productive agriculture while also protecting and strengthening the ecosystem? For the first time, the World Economic Forum 2016 Global Risks Report placed the failure to mitigate climate change at the top of its ranking, pointing to agriculture as one of the most vulnerable sectors to climate fluctuations. 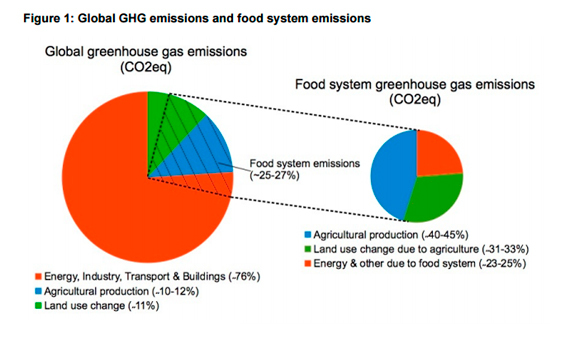 As well as its vulnerability to such changes, the global food system is in itself an important driver of climate change, contributing one fourth of the world’s greenhouse gas emissions (figure 1). And here is another eye-opening figure, provided by the University of Queensland: nearly 60% of greenhouse gases produced from food are of animal origin. Figure 1: Oxfam (2014), Standing on the Sidelines. All food produced on Earth has an ecological footprint. Oxfam has developed an online tool that details the environmental footprint of the most common foodstuffs (rice, corn, soya…). Are all “green” foods equally sustainable? It is not enough to remove meat, animal derivatives and industrially processed foods from our diet. We need to be highly selective about what we grow. The UN has given a hint, declaring 2016 the International Year of Pulses. Why? It is calculated that around the world some 190 million hectares of pulses help fix between five and seven million tons of nitrogen into the soil, meaning lower fertilizer requirements than most crops. Pulses thus help to support food security, reduce greenhouse gas emissions and also provide the nutrition that users need. Find out more about pulses in this collection of infographs from the FAO to raise awareness of the International Year of Pulses.